How do I disable Autoplay from opening every time I plug in my digital camera or a USB thumb drive? Autoplay serves a potentially useful purpose in letting you select which application takes control of a CD, USB drive, or flash memory card. When AutoPlay is enabled on your PC, any CD containing an Autorun.inf file will automatically launch its primary purpose as soon as the CD is inserted in a drive or USB cable is connected to a port. Windows XP users have probably noticed a pop up menu (like the one below) asking which program should be used for a particular type of content each time a CD, DVD or flash memory card is inserted. 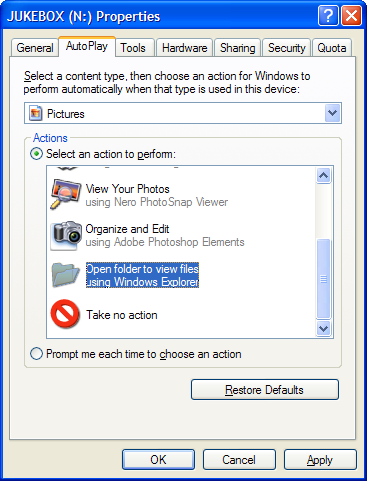 The window offers the option to either perform the same action each time similar content is inserted; or to continue prompting for an action each time. 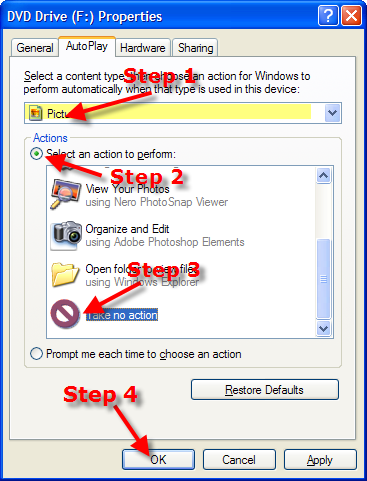 To disable Autorun for a particular type of content (in this case music) select Take No Action. To access this menu again, open Windows Explorer by typing Windows Key+E on the keyboard. Right-click the drive you want to configure and choose Properties from the menu. 1) Select each content type in the top drop down menu. Repeat these steps until you run out of content types in the list. If you want to always view the contents of a disk when inserted in your system, choose Open Folder to view files instead and you can browse your media. From Explorer, it's a simple matter to right-click a file and choose the application to open with.